Make this piece of furniture distinctly yours and complement your room décor by choosing the perfect fabric or leather from a huge range of options, including woven fabrics, leather match, and stain-resistant bonded leathers. Contact your retailer to learn more about the upholstery options offered on this frame. When building a cozy room that the whole family will enjoy, its important that your furniture be both comfortable and versatile. This spacious sectional sofa is all that and more with its dual power recliners, chaise lounge, full sleeper mattress, and drink holder console. This sectional sofa is easily able to seat five people, so everyone can enjoy the exceptional support of our stress-relieving comfort cradle seat cushions. The sleeper mattress is fitted with our specially-engineered iRest support system, a dense foam and gel-filled mattress that eliminates the excess heat usually associated with foam mattresses. This incredible piece will make a great addition to all manner of living room and home theater set-ups. Sectional also available with power reclining seats . The Grand Torino Casual Four Piece Power Sectional Sofa w/ Full Sleeper and Drink Console by Lane at AHFA in the area. Product availability may vary. Contact us for the most current availability on this product. 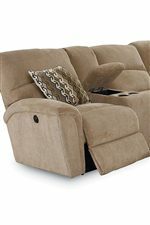 230-26 Grand Torino Armless Full-Size Sleeper 1 0" 0" 0"
230-68 Grand Torino Left-Arm Facing Double Reclining Loveseat With Storage (Power) 1 0" 0" 0"
230-04 Grand Torino Wedge 1 0" 0" 0"
230-86 Grand Torino Right-Arm Facing Stationary Chaise 1 0" 0" 0"
Padding & Ergonomics At the core of each seat cushion is high-density, high-resiliency foam which is wrapped with thick layers of polyester fiber to ensure comfort and durability. Sleeper mattress fitted with an iRest™ support system that takes a dense foam and infuses it with gel to increase comfort and support while eliminating excess heat often associated with sleeping on a foam mattress. Designed for optimum comfort and functionality, the Grand Torino collection is an exceptional furniture choice that your whole family will love. 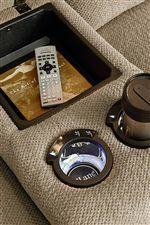 Grand Turino sectional sofas are packed with luxurious extras, like built-in lighted cupholders, power seat recline, and our specially engineered gel-infused foam sleeper mattresses. Each seat in these sectional sofas is sculpted to contour your body and gently hug with the feel of high-density foam. The pieces in the Grand Torino collection are stylish as well as comfortable, and feature the clean, chic look of envelope arms, knife-edged bustle backs, and contrasting toss pillows in the fabric of your choice. Build a Grand Torino sectional that perfectly fits your home decor and lifestyle. 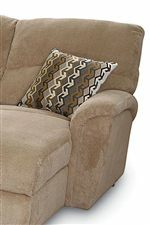 The Grand Torino collection is a great option if you are looking for Casual furniture in the area. Browse other items in the Grand Torino collection from AHFA in the area.